The hiop extractor header is manufactured in highly polished 100% stainless steel. All six branches are of equal length and diameter. 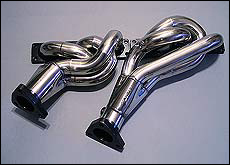 The systems are developed as simple "bolt on" units for easy after market installation (no welding), and to provide increased mid-range torque and top end power, in both standard and perfomance tuned BMW E36. E39 and E46 six cylinder cars.